For almost a century and a half, Bulfinch's Mythology has been the text by which the great tales of the gods and goddesses, Greek and Roman antiquity; Scandinavian, Celtic, and Oriental fables and myths; and the age of chivalry have been known. 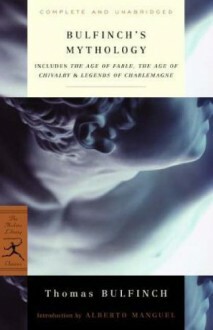 The stories are divided into three sections: The Age of Fable or Stories of Gods and Heroes (first published in 1855); The Age of Chivalry (1858), which contains King Arthur and His Knights, The Mabinogeon, and The Knights of English History; and Legends of Charlemagne or Romance of the Middle Ages (1863). For the Greek myths, Bulfinch drew on Ovid and Virgil, and for the sagas of the north, from Mallet's Northern Antiquities. He provides lively versions of the myths of Zeus and Hera, Venus and Adonis, Daphne and Apollo, and their cohorts on Mount Olympus; the love story of Pygmalion and Galatea; the legends of the Trojan War and the epic wanderings of Ulysses and Aeneas; the joys of Valhalla and the furies of Thor; and the tales of Beowulf and Robin Hood. The tales are eminently readable. As Bulfinch wrote, "Without a knowledge of mythology much of the elegant literature of our own language cannot be understood and appreciated. . . . Our book is an attempt to solve this problem, by telling the stories of mythology in such a manner as to make them a source of amusement. "Thomas Bulfinch, in his day job, was a clerk in the Merchant's Bank of Boston, an undemanding position that afforded him ample leisure time in which to pursue his other interests. In addition to serving as secretary of the Boston Society of Natural History, he thoroughly researched the myths and legends and copiously cross-referenced them with literature and art. As such, the myths are an indispensable guide to the cultural values of the nineteenth century; however, it is the vigor of the stories themselves that returns generation after generation to Bulfinch. An excellent reference for what it is concerned with. Almost exclusively focused on the Western (e.g. Hellenic and Roman) lineage of mythology, so do not expect a comprehensive overview of world mythology.